Each class took part in either a colouring completion or a slogan competition recently. There were some colourful entries from the junior classes and some excellent slogans from the senior classes. It was tough to choose a winner. 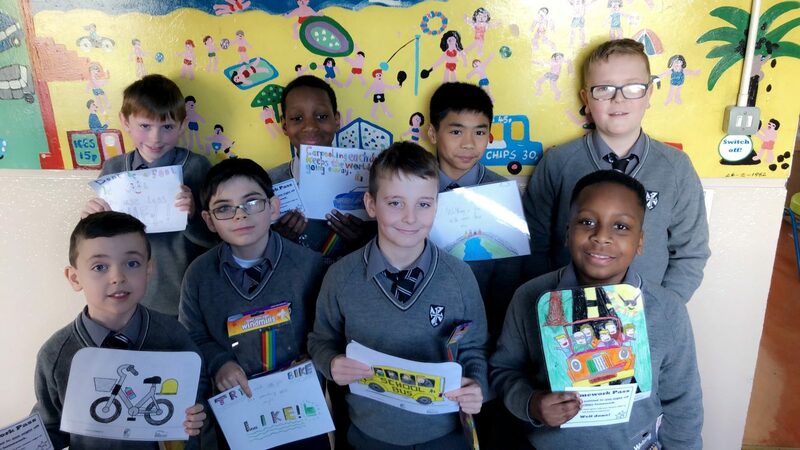 However, one winner was chosen from each class and an overall winning slogan was chosen to be our school slogan for this year’s Green Schools theme on Travel. Thanks to everyone for taking part. The overall winning slogan was by Luke in Mr Conlon’s class. Well done Luke.………His winning slogan was….Don’t be a fool, be cool and use less fuel! Congratulations to all the boys.